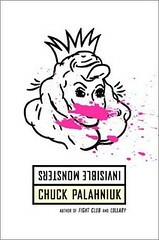 Just finished reading Invisible Monsters by Chuck Palahniuk. Most people know him as the guy who wrote Fight Club. Invisible Monsters is so full of twists and turns that I feel that I’d give important plot points away with even a brief summary of the book. But basically, it’s about a fashion model who gets her jaw blown off, and ends up going on a physical and psychological journey with some, um, interesting characters. The style of this book sets it apart from most others. It’s written like a fashion magazine; that is, it uses too many adjectives, the paragraphs are short, and it jumps around from topic to topic so that you feel like you’re never getting the whole story at one time. I actually found that this made it more enjoyable to read, rather than less, though perhaps that just says something about my attention span. The content is loud, shocking, hilarious, and campy. Easily disturbed or easily disgusted people will probably want to avoid this (though if you really wanna throw up in your mouth while reading, check out his short story Guts (click to read the whole story)). The themes running through Invisible Monsters will be familiar to anyone who’s read Palahniuk’s other novels, or seen Fight Club. I’ve heard rumours that Invisible Monsters was being worked on as a movie. I find it hard to picture this as a movie, though. Without giving much away, let’s just say it would have to employ some “unique” actors and/or actresses. I enjoyed the book from start to finish, though, so I’d recommend it to anyone with a strong stomach looking for a fun read. It’s a new school year, so how’s about I start blogging on this blog again? Sounds good. As many of you know, I have another blog, but I only post relatively tame posts on this one (since it’s the one I link to in my e-mail signature, and may be seen by people who have the power to hire/fire me). I’ve been slacking in copying the tame posts over to this one lately. Well, I just added a bunch of posts, and I’ll continue to do so. I’ve also decided to get more serious about school and research, by keeping up with the latest literature in sciency stuff. This will probably translate over to this blog, since blogging about interesting stuff, and my opinions on it, will help motivate me to really think about what I’m reading.